Six brand new heart defibrillators have arrived on campus. Now all that’s needed is volunteers – students, faculty and staff -- willing to learn to use them. A defibrillator is a medical apparatus that delivers an electric shock to jump start the heart of a person whose heart has stopped. One short lesson is all it takes to master the new, simplified defibrillators. “These units are more responder friendly and easy to use,” says Kassandra Gibbs ’12 of the student-staffed Brandeis Emergency Medical Corp (BEMCo). “They are clear in their directions.” In addition to written instructions, the machine gives audio commands telling the volunteer what to do such as “Stay calm” and “Call for help”. BEMCo is made up of 65 trained student volunteers who are on call 24 hours a day, seven days a week, providing emergency medical services for the campus. BEMCo staff is offering everyone in the Brandeis community free training in the latest “Heartsaver” course, mandated by the American Heart Association. Everything is falling into place to make the new defibrillators available as needed. Alarmed cabinets to store the six new apparatuses in readily accessible public places are scattered throughout the campus, at Usdan upper lobby, Shapiro Campus Center, Hassenfeld Conference Center/Sherman, on the bridge between the Mandel center for the Humanities and Olin-Sang, in the Heller School and in the International Business School. 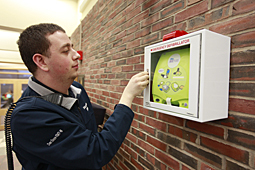 These six defibrillators compliment others already on campus, including three that are kept at Gosman Sports Center. The idea, says Saxe, is to have not just the equipment, but also trained people scattered throughout the campus to keep response time down. The goal is to have 200 people undergo the training. That threshold would earn the Brandeis campus the distinction of being a “heart safe community”. Under new training guidelines, mouth-to-mouth resuscitation is out and chest compressions are in. Compressions and defibrillation as quickly as possible have been shown to save lives. To sign up for the free CPR training, email brandeisaed@gmail.com and provide contact information and the best evening and weekend availability. The class requires a single two and a half hour commitment. The first class is to start on Monday Nov. 8, which is National Collegiate EMS week and National Collegiate CPR day.